Sunday was the 75th anniversary of the Golden Gate Bridge. If you’ve never visited the bridge, it’s quite a sight to see. On a clear day, it sparkles in the sunshine. I’ve visited it many times. Whenever I cross over it, I can help but think of the engineering genius that it is. They managed to make that bridge earthquake safe long before retrofitting became the norm. I can’t imagine what it was like working on the bridge. I watched a documentary about the construction this afternoon. I was incredulous to learn that back in the 1930s a safety net for bridge construction was not required under the law. The Union fought hard for a safety net under the Golden Gate which save many lives. Workers tried unsuccessfully to get a safety net for construction of the Oakland Bay Bridge, which was built about the same time in as dangerous of a situation. Thank goodness for modern safety laws. I had several relatives living in San Francisco at the time. I wonder if any of them are the faces in the films and photographs of the first group of people to set foot on the bridge. I wonder what they thought as the bridge was being constructed. I imagine they thought it was a bit ridiculous to spend so much money while people were starving. Then again, that bridge construction created many jobs–jobs that people were thankful to have. I bet that once it was done they were struck with awe at its magnificence. It must have been something to be there that day when the ribbon was cut. 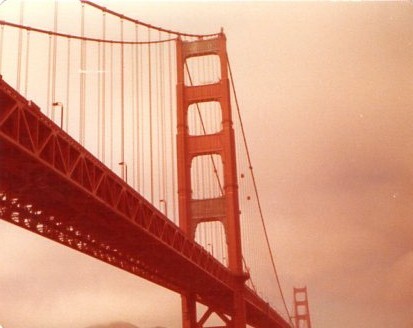 I have many memories of the Golden Gate Bridge. I took this photo way back in 1976. My 6th grade class went on a field trip to Fort Point and the Presidio. My Dad was a volunteer driver. We took 4 6th graders in a Ford Pinto. Don’t even think about seat belt laws. We had one kid laying in the back. Hey, it was an Instamatic. Not the best camera technology. Still, the photo has survived over 30 years. I still remember that field trip. I can remember the Presidio very well. I remember standing out and looking at the bridge. It was a beautiful sight then and it’s a beautiful sight now. Happy Birthday to the Golden Gate Bridge! May you continue to create memories to visitors for years to come. I see according to Geneabloggers today is your two year anniversary since you’ve been blogging. Happy Blogiversary.